55 years ago Ivan Vuksta became a leader of the Methodist congregation in Kamenitsa. He survived despite the persecution, the refusal of the government to officially register the church, the forbiddance to preach the Gospel and sing hymnals. «Pastor Ivan had an enormous vision from God. He saw new Methodist congregations, the churches filled with the youth, who serve Lord with all powers. When God grants you with the vision like that, you can hardly be stopped». 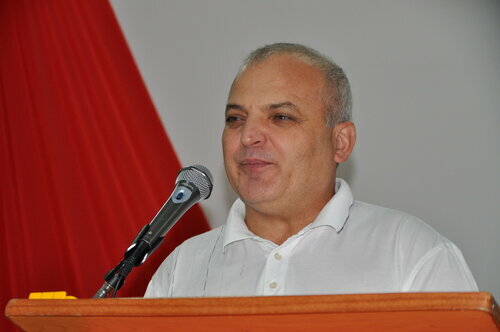 (Bishop E. Khegay «Ivan. Anna. Young Hah». Moscow, 2014). Years and years passed, and the dream of Anna Eklund, Young Hah Kim and Ivan Vuksta finally came true. 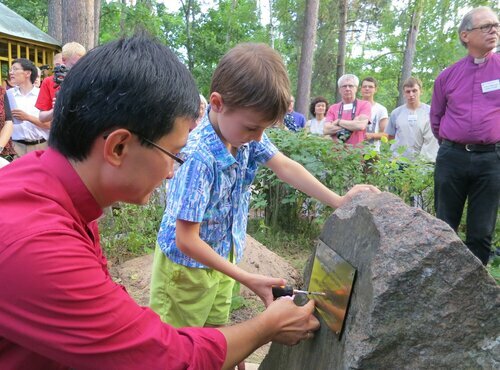 Their names, alongside with the names of other Methodist heroes and martyrs, were enumerated by UMC Eurasia bishop Eduard Khegay, in front of the participants of the Festival «125th anniversary of the Spirit movement: preserving traditions, we transform the future», which took place in August 6-10, 2014 in the Pilgrimage Centre “Crystal” near Voronezh. At the Festival Anna Eklund’s spiritual heir bishop Hans Vaxby was lecturing to the topic “The past and the present of the UMC Eurasia of today”. Devotion was held by the Ukraine DS Vasily Vuksta, the son of Pastor Ivan. 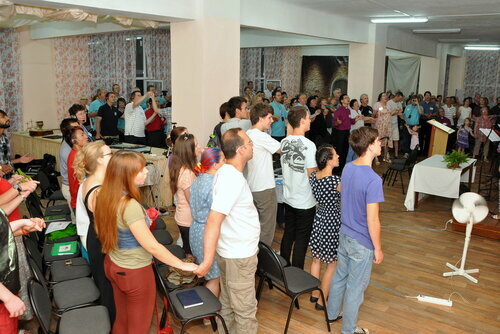 In their welcome letter Bishop Eduard Khegay and Chair of the organizing team DS Andrei Kim encouraged the Festival participants to «be filled with the blessing, learning and fellowship with the United Methodists from all over the world». And the participants really were. «I really liked the idea of the Festival «125th anniversary of the Spirit movement: preserving traditions, we transform the future», where we could get acquainted with the history of Eurasia UMC. I consider it very important to know the background and the history of your church, learning the life of its heroes and martyrs. Those are certain flashlights that help us move on in our Christian living. Their life and ministry experience reflects our personal background and the issues we face. The best thing I liked about the Festival was the Christian fellowship of brothers and sisters. This was not only pleasing but also in a way a great deal supportive. It’s not a common thing for our everyday life to have the relationships and fellowship of this kind. We face the worldly things and we literally live within this system, and pretty often the routine swallows us. But here we’ve been all together, united in one Spirit, sharing our testimonies and revelations, praying together, winning together, and learning together. It’s been in a way a spiritual resort place for our souls. I’ve experienced lots of things through this Festival. We’ve had wonderful station and workshop leaders. To add to this, I had been standing on a sort of a crossroad before the Festival started, in terms of choosing the direction of ministry. That’s exactly where I was given a revelation, a direct response, what kind of ministry God wants me to do. And my soul responded to this calling. I got useful information and received our pastors’ and leaders’ support and encouragement, especially my pastor’s. 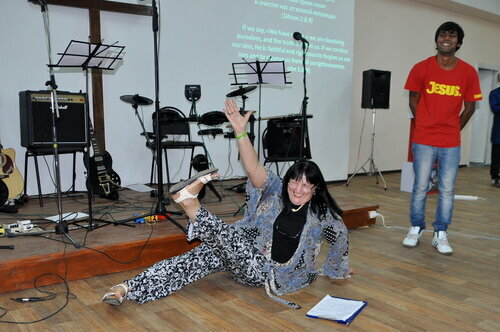 I think I will start doing this ministry (small groups leadership) in my home church in Samara». During the Festival, both the manifold programme and the opportunity for the Christian fellowship were combined in a really amazing way. One can mention morning worships, Bible studies, the bishops’ lectures, workshops, cognitive stations, sport events and the musical by Oleg Pozharsky, called “The Last Room Left”. The audience hall decoration was designed by the DS Irina Margulis. The inspiring farewell concert named “Do you remember the way it all started?” was led by the DS Irina Mitina. Each Festival day was filled with the sense of oneness and unity. Firstly, because of the unity between the past, the present and the future that symbolized different generations in the church leadership. At the historical-theological station the participants couldn’t hide their tears, while watching the photos from the archive, shared by the President of Moscow Seminary Sergei Nikolaev. Those pictures represented the PAST – the life of Eurasia Methodists back to the 1930s. «The 30 year old generation» – Elena Melnikova, the spouses Fyodor and Ekaterina Kim, Oleg and Yulia Starodubets, Olga and Igor Kobzev – were absolutely willing already in the PRESENT to responsibly pick up the most complicated ministries in Eurasia. 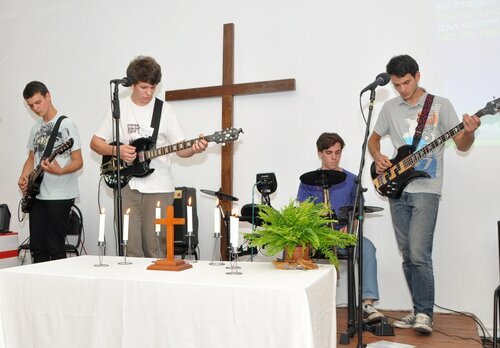 At the same time, our FUTURE, the youth, revealed the highest level of music ministry at the Festival. Secondly, truly amazing was the oneness among the participants of the Festival, both from Eurasia and from all over the world. Not a trace of disputes or misunderstanding in political and theological issues – the absolute unity in one Spirit. The guests from the US, England, Germany, Switzerland and Korea were as warmly welcomed as “the locals”, the participants from Russia, the Ukraine and Kyrgyzstan. Right after the closing ceremony Bishop Eduard Khegay, the youth leader from the Ukraine Vasylyna Babych and the young David Serdukov attached the tablet to commemorate the Festival. 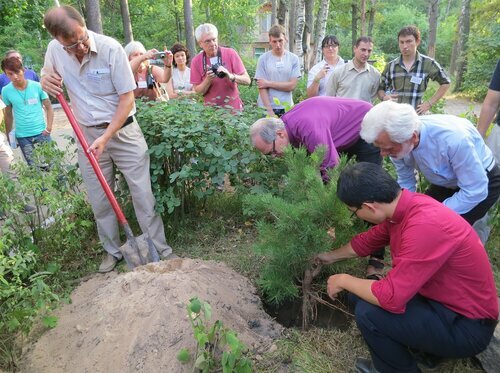 The older guests, Hans Vaxby, Ullas Tankler, David Freeswell, Simon Zuercher and others assisted Bishop Eduard in planting the commemorable tree just amidst „The Crystal” Centre. «It’s been a huge privilege for me to take part in our Festival. We've been here from afar, Kyrgyzstan. Despite the distance, I’ve been blessed to be with you here. I see the Festival is organized at its best, a very detailed planning. And I really want to pay respect to everyone who’s prepared this Festival. May Lord bless you to become still more mature. I very much liked to witness the unity of our church. Not just in terms of being gathered together. But rather the unity of various generations. That proves the fact that our UMC is a connectional church, that unites the past and the present. I also believe in the great future of our church. I very much liked the stations. I took part in them daily. I especially enjoyed the Historical -theological station and the Social evangelism station. The latter widened my understanding of God’s mission and our calling here on earth. The historical-theological station inspired me to be more careful with the documents and records we keep in the church, to save the pictures of our ministries. Maybe, in 100 years someone will get interested in the history of today’s Central Asia UMC, and these documents will be of great help in learning the routine life of the church that we’re living in the name of Lord Jesus, for the sake of the Kingdom of Heaven. Of course, I wish that everyone, when they leave for their churches and areas, may keep the flame they’ve received here during these days; so that each and every one of us would stay in contact with other participants. 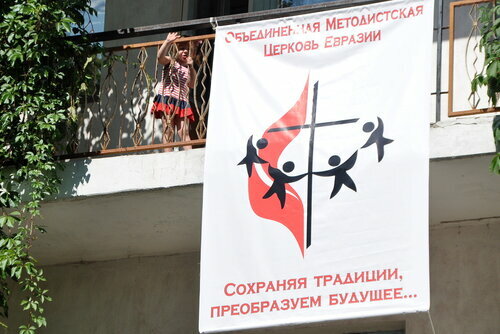 And I truly believe we’re going to celebrate the 130th anniversary of Methodism in Eurasia. May the Lord bless you all». The spiritual heirs of Ivan Vuksta, Anna Eklund and Young Hah Kim have left for their churches and countries to PRESERVE TRADITIONS AND TRANSFORM THE FUTURE. All of a sudden, above the tombs in Finnish site of Turku, and Kamenitsa, the Ukraine, and in Siberia, a rainbow started to shine. People were gazing at heaven, smiling: they knew that sooner of later goodness and faith would inevitably win. «First of all, I’d like to thank the organizing committee for the immense work they’ve done. I especially liked the way workshops were done. There we had the opportunity to learn new things; this we might lack in our congregations. I’m in drama ministry in my church, that’s why I was impressed with the musical “The Last Room Left” by Oleg Pozharsky. My personal understanding was as follows: it doesn’t matter much what drama experience you have, your desire to do things is what matters. If you have it, you can do amazing things; this we ourselves witnessed. With the musicals like that, one can drive around the theatres, showing them and pleasing people, so that they knew how God loves us. When I come back to my congregation, I will gladly share my joy about the Festival with my brothers and sisters and encourage them to come next time if they have a chance. Here we had this unique opportunity to share our experience and be blessed by brothers and sisters, who came not just from the CIS, but also from other countries. The people of diverse culture and mentality had the opportunity to learn more about new ways of evangelism and get a huge experience. I want to give personal thanks for having me within the Central Asia delegation, and I had a privilege to participate in this Festival. I’m absolutely happy to have become a witness of this festivity. 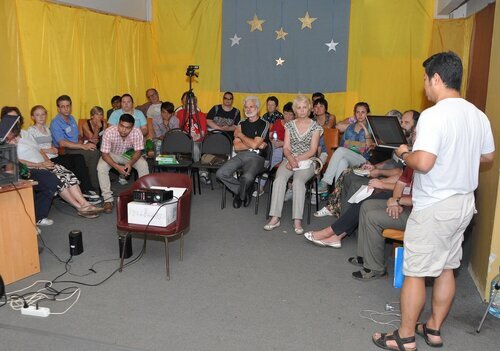 I also revealed new ways of evangelism that I could use in my country». «I was amazed that, in spite of the diversity of the participants, who represented many nations, due to the Holy Spirit’s movement, we managed to be united in one soul, in one mind with one another and with Christ Himself. 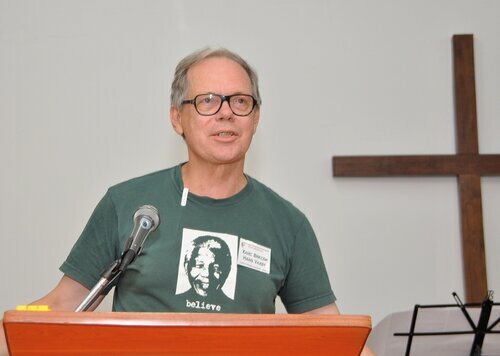 A major reason for that was a well coordinated work of the translators’ team, with Vladimir Ditmar (Kirov UMC) as a leader. I mostly enjoyed the morning worships during the Festival. The workshop “Upper Room Ministries” (“Mesto vstrechi” Russian edition), led by the pastors Nicola Vidamour and Lena Kim, also impacted my experience and pleased my heart. My wish is to see all the new friends I’ve made, some day again. 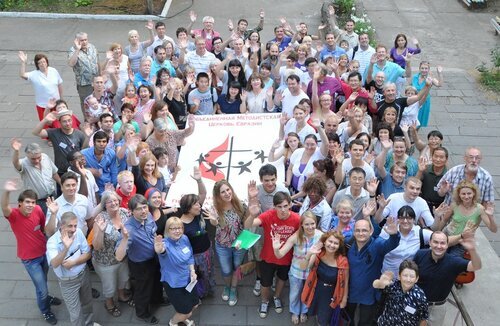 God’s blessings to all who participated in the Festival, devoted to the 125th anniversary of Methodism in Eurasia».